You wake up in the morning and reach for that strong cup of coffee. You have an addiction to cigarettes. You unwind at night after a hard day at work, with a glass of red wine. You are a creature of habit and have your usual cup of tea after dinner at night. Then one day, you look in the mirror, and notice that your once white and shiny smile, is now a yellow and more dingy version of itself. 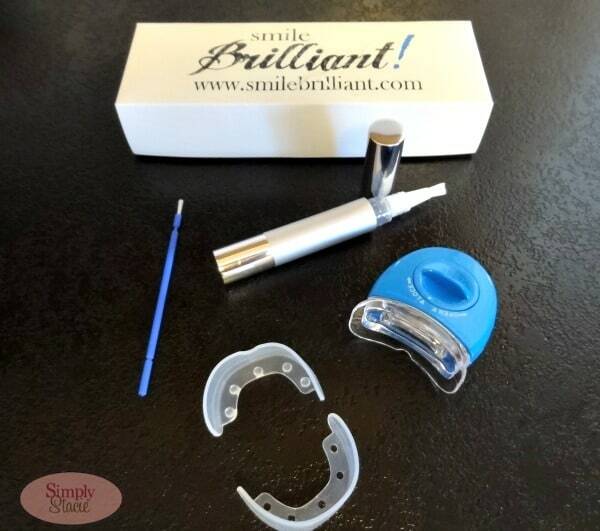 Smile Brilliant LED Whitening System may just be the product you need to perk up that smile. To help you go from a tight, closed mouth grin to a brilliant, eye squinting smile that shows off your beautiful white teeth. I know that when my teeth are white and bright that I feel more confident and self-assured. Many people may not even notice or realize that their smiles have faded and yellowed over the years, especially if they indulge in a few of the habits mentioned above. I pay close attention to this and whiten my teeth every six months to keep that fresh from the dentist look. I have tried many products over the years for my teeth and was pleasantly surprised by the Smile Brilliant LED Whitening System. Included in the kit is a High intensity Ultra-Blue LED activating light (batteries are included), protective trays for both top and bottom teeth, a 4 ml professional whitening gel pen (35% concentration), and the instructions to go along with it. There is also a tiny brush that I used to get in-between my teeth where some of those stubborn stains like to hide. The instructions are easy to follow in a step by step manner. The instructions say that you can have a session last from 30 minutes to 2 hours, depending on your comfort levels. If you’re like me, and can’t imagine not talking for that long, then 40 minutes should do the trick for you. There was no awful taste, no burning and no discomfort while the tray and LED light were in. Now I have fairly white teeth to begin with so my results may not be as typical as someone else who drinks coffee and tea or smokes on a regular basis. But I do enjoy a glass of red wine from time to time and I know that does not help with stains. So after one 40 minute treatment, I did notice a slight change. After three more 40 minute treatments, there was enough of a difference that my husband was able to easily notice it. For those with more problem teeth, this system would be well worth the money. And at just $39.95, it’s definitely worth the price tag. Connect with Smile Brilliant on Facebook and Twitter. I like that its much easier on the pocket than other systems! I would like to try their teeth whitening pen. I learned you get a 30 day money back guarantee. i learned that the teeth whitening gel would be useful for me! I like that it is custom molds, I have kits that I never use because the tray doesn’t fit my teeth right. This sounds awesome! I liked that it has a “lifetime replacement warranty” and I learned that there is a 30 day money back guarantee if you are not satisfied. Unrefrigerated, our Hi-Intensity Teeth Whitening Gel has a 2 year shelf life. Refrigerating the Hi-Intensity Teeth Whitening Gel adds 1 year of shelf life to that 2 years for a total of 3 years. It looks like it is a easy product to use. I learned you can sleep in your whitening tray. These trays are identical to those produced by dentists around the world. Dentists charge more than $400 for a set of custom-fitted trays because they work and last for years. I learned their process is used by 95% of all cosmetic dentists.